Dangerous Goods are substances that are corrosive, flammable, explosive, spontaneously combustible, toxic, and oxidising or water reactive. Hazardous goods transport should not be taken lightly as these goods can be deadly and can seriously damage property and the environment. Therefore, it’s important that they are stored and handled safely and display the appropriate hazardous goods labels in accordance with the dangerous substances act. Petrol, LPG, paints, pesticides and acids are examples of commonly used dangerous goods. They are defined in the Dangerous Goods Act 1985 and are classified in the Australian Code for the Transport of Dangerous Goods by Road and Rail (Dangerous Goods Code) according to their common hazardous properties. At Freight Quote Australia we do not transport dangerous goods freight without a prior written agreement. Get in touch with any enquiries and to arrange a dangerous goods courier service. Each substance or article of Dangerous Goods named in the Code is assigned to a particular Class relating to its primary hazardous property. 2.2 Non-flammable, non-toxic gases i.e. helium and oxygen. Liquids which can burn and have a Flash Point (not boiling point) below 60.5°C i.e. acetone and kerosene. Is helium flammable? No, but it is still listed as hazard freight goods in Class 2 which includes gases which are compressed, liquified or dissolved under pressure. i.e. hydrochloric acid, sodium hydroxide and batteries containing acid. i.e. dry ice, asbestos and environmentally hazardous substances. Methanol is a highly flammable liquid that is also toxic. It meets the classification criteria for both Class 3 and Division 6.1. As its flammability is its primary hazard, Methanol is categorised as Class 3 dangerous goods. It is also shown in the Australian Dangerous Goods Code as having a Subsidiary Risk of 6.1 to cover its toxicity hazard. 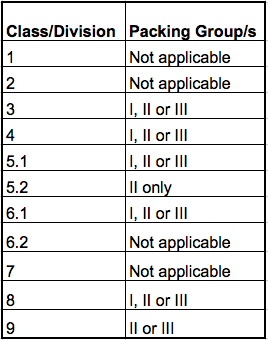 • Packing Group (referred to as ‘Packaging Group’ in earlier versions of the Regulations and Code) does not apply to those Classes/Divisions of Dangerous Good against which ‘Not applicable’ appears in the table below. The greater the degree of danger, the more stringent the packaging requirement for the substance. Further information and advice can be obtained by contacting DET’s OHS Advisory Service on 1300 074 715. Source: Victoria State Government Guidance Sheet 2 Dangerous Goods Classification System.